Mitsubishi's 3DC1000 converter takes that single frame (and other forms of compressed 3D) and converts it into the checkerboard format supported by its televisions, which combine with the IR emitter and active shutter glasses included in the 3D starter pack to produce one 3D image. The only complication here is that our older cable box doesn't support HDMI 1.4 for automatically adjusting things to the correct setting, so besides connecting the HDMI passthrough and sync cables, we had to take the extra step of manually finding the proper setting, and switching the HDTV to 3D mode before we were ready. Once we passed those hurdles, all that was left was switching on the battery powered glasses and sitting back on the couch to watch some football. 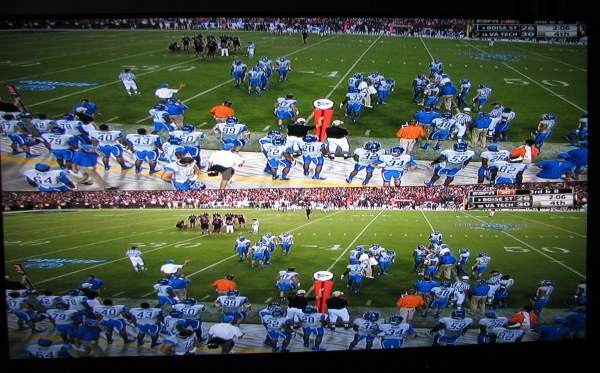 ESPN clearly spent a lot of time figuring out what camera angles at Fed Ex Stadium worked best for 3D, and when Boise State took the field it was pretty hard to remember the players weren't actually rushing directly into our living room. The main highlight of a 3D broadcast over the HDTV version is definitely a generous amount of lower broadcast angles and with the added depth clearly on display, it was the closest thing we've felt to actually having tickets to the game, except these seats are always 5 rows up and perfectly positioned for the current play. 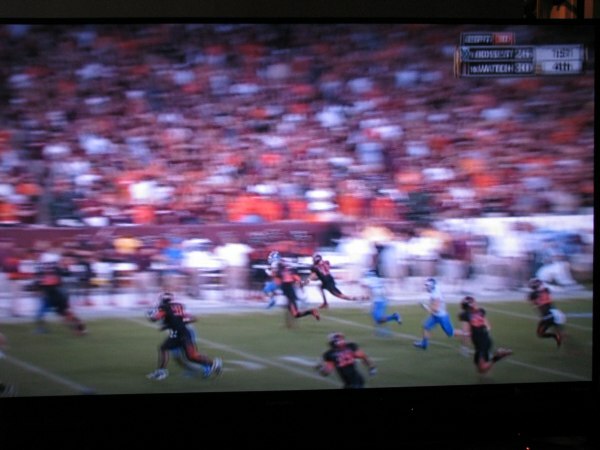 Many of the issues we noticed during last year's production weren't present here, we're not sure if it's ESPN's choice of broadcast technology or what, but the ability to capture fast motion like a pass moving quickly across the screen or Va. Tech QB Tyrod Taylor taking off on a designed run was completely smooth without any blurriness. Watching a punt get blocked live from the end zone was indistinguishable from being at a real game, except the beer was cheaper. The colors were also vibrant, while the glasses do dim things slightly; the TV compensated with extra brightness that helped Boise State's blue helmets pop right off the screen. Of course, like any early technology, there were still a few issues. On our end we noticed occasional flickering from the broadcast feed, as though it went completely black for a frame or two, which was also noticed by other viewers posting on AVS Forum. With so many elements between our eyes and the action on the field it's hard to tell if ESPN, Comcast, or any of the equipment on our end was at fault, but it was definitely an issue. Also, while ESPN kept the motion clear and the picture remained sharp, even with the reduced amount of vertical pixels, particularly in the first half we noticed issues with the cameras occasionally losing focus on the action. 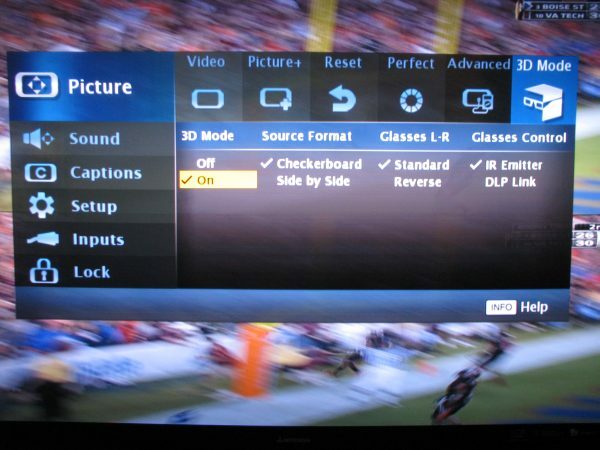 Another issue was a lack of 3D menus on our old cable box, when run through the converter, it's impossible to navigate them or switch to another channel while watching the game. Though it recorded on the DVR without issue, given the amount of setup required, once you start watching, you're pretty much locked in. All in all, Virginia Tech's poor first quarter performance was a bigger issue than any of these, once the game got more competitive down the stretch, those problems started to fade away. 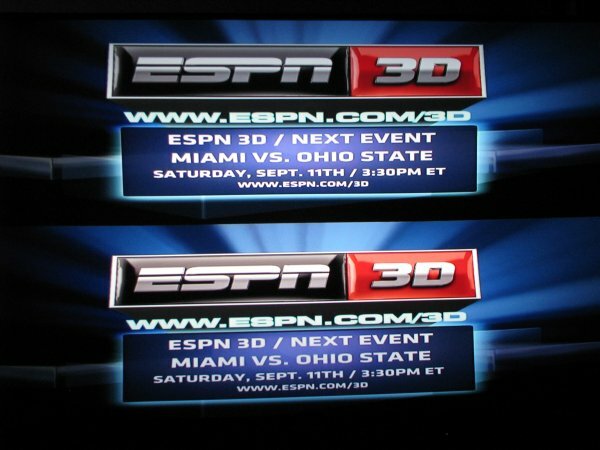 It's obvious that in 2010 3D is still an early adopter's product, with exclusive broadcasts and movie deals still ruling the day, but once it spreads out we'd suggest grabbing a pair of glasses and checking out broadcasts in your area -- for sports the experience is a worthwhile one. A new TV setup might be a bit pricey, but at a fraction of the cost of lower bowl tickets to a big game and the ability to catch the action from all around the field, we're already looking forward to a premiere Ohio State/Miami game Saturday afternoon.